If there’s one thing that stands out about central government, it’s the appetite for digital transformation. 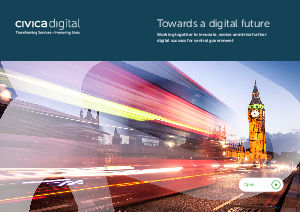 Whether delivering new customer-facing websites to drive better engagement with services or establishing a centre of excellence to accelerate the take-up of robotic process automation, UK government is embracing opportunities to modernise with new technologies. But despite the great strides made in the last few years, the UK is slipping backwards in E-Government development terms – down from #1 in 2016 to #4 in 2018, according to the UN E-Government Survey 2018. Some argue this is due to the government having tackled the more straightforward digitisation opportunities and because it is now facing the bigger, more complex systems that need modernising. Our research shows that there are also wider challenges, including uncertainty around the impact of Brexit, budgetary pressures and emerging technologies, coming into play. So what needs to happen to overcome our challenges, keep progressing and push government forward towards a digital future? And as a government leader, what’s your role in making it happen?